We are located in the center of Plovdiv. With 2 minutes walk you are in the main pedestrian street and with 5 minutes in the old town. The city Plovdiv is always alive and has its unique charm. 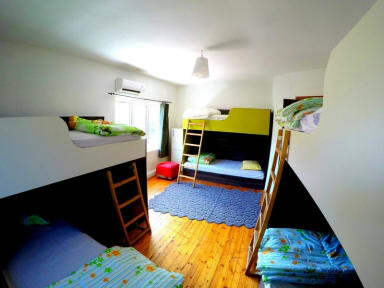 The hostel is in a quiet neighborhood and we also have private rooms! Super rad spot! One of the best hostels we stayed at on our trip. Really cool vibes and good people. 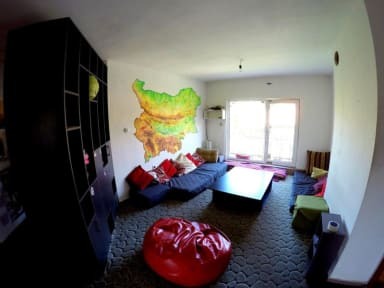 I loved my stay in Funky Monkey Hostel in Plovdiv. Everything was perfect and suuuuch a comfi bed. I would come back again and again, and again. Very nice Hostel, very nice staff! Great location, staff member was super nice and helpful. Very chilled vibe, highly recommend the beanbag rooftop area! Not a huge amount of social activities so maybe not the best for a solo traveller. Had a great stay here. The hostel was clean and well organised, and was in walking distance to everything. The staff were so helpful and lovely to converse with. I accidentally arrived later than expected but a member of staff went out of her way to accommodate me late hours, which was greatly appreciated. Only issue is stairs- theres a lot to climb before you get to the reception which isn’t ideal for people with lots of stuff but I would still definitely recommend it! Our time at this hostel was negatively affected by the very rude staff member Damian who assisted us throughout our stay. We were mocked every time we talked and he was more interested in facebook than helping us organise our bus. I would not stay here again or recommend this hostel. The atmosphere was very uninviting.